HELEN graduated from University of Sydney with a Bachelor of Arts and a Diploma in Social Work, winning the Social Work Prize from the University. She initially worked as a social worker and was appointed as Commissioner of the then NSW Ethnic Affairs Commission. In 1985, she graduated with a Bachelor of Laws at the Macquarie University and was admitted as a Barrister of the Supreme Court of New South Wales in 1987. 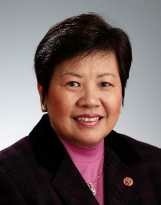 Helen then commenced her political career and is the first elected Chinese-born parliamentarian in Australia. She served in New South Wales Legislative Council for four terms, a period over 15 years (1988-2003); and was Deputy-President for 8 years and Chairman of a number of Parliamentary enquiries. Helen was a Governor of the Board of Governors of Macquarie University, University of Western Sydney and University of Technology, Sydney. She is now appointed as a Patron of the Macquarie University Foundation. Helen is a longstanding advocate in the areas of education, race relations, youth issues and social justice and her efforts have been recognized with a number of awards including the Macquarie University 2005 Alumni Award for Distinguished Service (Community Service), the Lions Club International 2006 Melvin Jones Fellowship, the New South Wales Premier 2008 Community Service Award and was awarded the prestigious Medal of the Order of Australia in 2012 by the Australian Government. In 2014, Helen is bestowed with an Honorary Doctorate degree in Social Sciences by the University of Western Sydney. In 2017, Helen is the recipient of the prestigious Lifetime Community Service Award by the Australian Chinese Community Association in Sydney.